The last time we heard from Oh Well, Goodbye, they were releasing the very excellent Swoon 7″, and we’re really excited to share this new number with you. This song will feature on the group’s new EP, Affinity Part One. 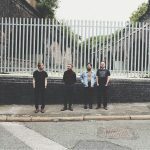 For me, the best thing about this new single is how deep the band delves into a beautiful darkness…there’s plenty of space hanging about, draped with unobtrusive bits of guitar and a bass line that guarantees tension. There’s just this enormous bit of space, and Phillip Rourke is there to fill it in with his voice, somewhat resembling Paul Banks. I love how things are just left open, left to your interpretation and your involvement. The new EP will be released by EDILS and Bleeding Gold on November 3rd, so you have time to acquaint yourself!